Every parent enjoys taking a picture of their children on their first day of school. This is a memorable day that every parent and child have throughout their lives. Make that picture much more special with a Personalized Back To School Frame! 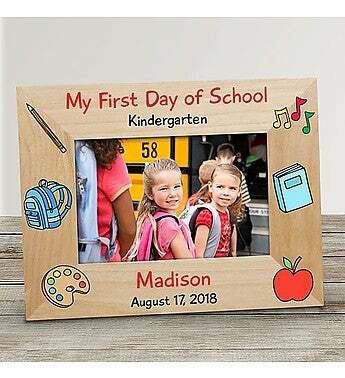 We will custom create this First Day Of School Pictures Frame with any grade, any name and any date. Makes a great Back to School gift to cherish forever. Wood Picture Frame measures 8 3/4"x 6 3/4" and holds a 3" x 5" or 4" x 6" photo.